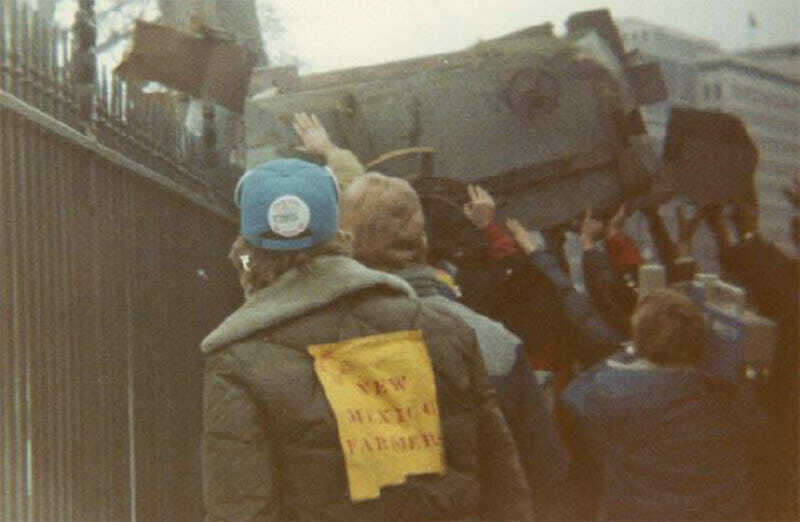 35 years ago today, thousands of farmers arrived in Washington D.C. for the second annual demonstration of the American Agriculture Movement (AAM). 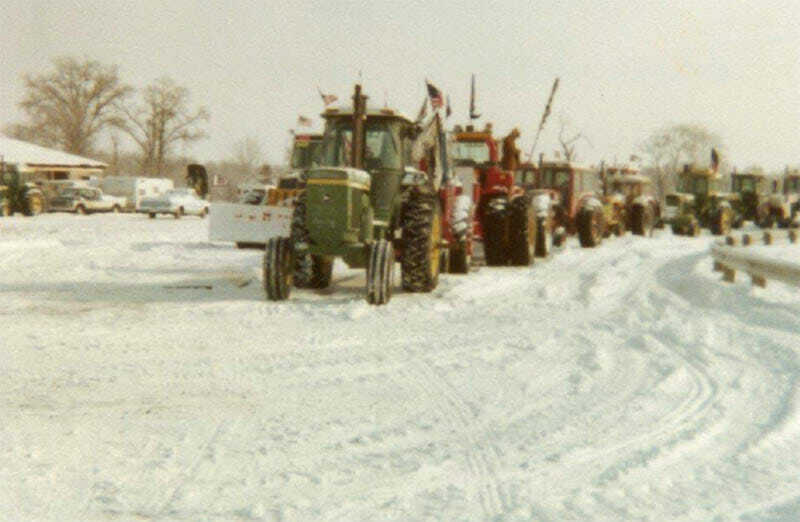 Some came on buses or planes, but most grumbled into the capitol atop an estimated 900 tractors. Their mission? Get the government and the public to support a more profitable and equitable industry for family farms. One of those farmers on the tractorcade was Larry Matlack, who now serves as president of the AAM. He had started his tractor more than two weeks before reaching Washington, pulling it past the gate of his farm in Burrton, Kansas to join a convey of vehicles crawling across the country at 100 miles per day. He remembers the cold winter didn’t make the journey any easier. “Never saw the sunshine in those 17 days,” he says. Image courtesy of the Kinsley Library. Photo by Darrel Miller. 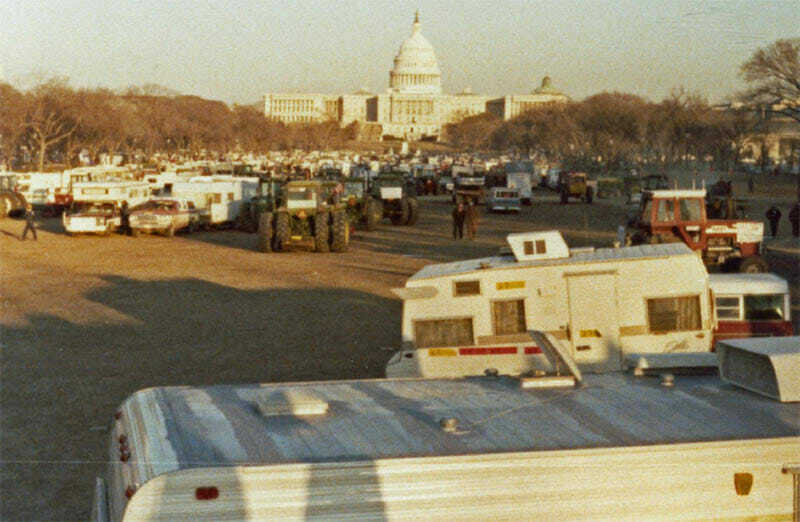 After stops at country fair grounds, public parks and mall parking lots the group converged on Washington on February 5th, 1979 much to the frustration of commuters and city officials. Within the day, 17 tractors had been impounded. Worried over further traffic delays, the police corralled the tractors in to the National Mall where they stayed for weeks, save a few permitted excursions around the empty streets of midday Washington. Photo courtesy of the Kinsley Library. Photo by Jack Wolfe. Photo courtesy of the Smithsonian Institute. Photo by J. Wooten. The national tractorcade marked a high point for the AAM, which had started out in the sleepy cafes of Campo, Colorado. As local farmers like Alvin Jenkins met to talk shop and tell stories, they found a number of shared frustrations with the current agriculture industry. In their estimation, both American government and industry leaders were out of touch with the needs of everyday farmers. They rallied behind the idea of “100 percent parity” for farm goods, which basically meant that the price of a crop should reflect the cost a farmer incurred growing it. Tractors coming into Washington. Photo courtesy of the Smithsonian Institute. Photo by J. Wooten. 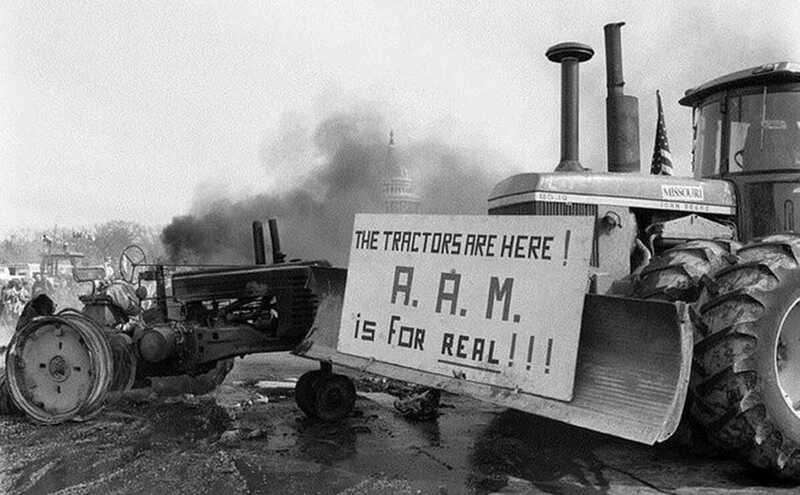 After a failed attempt to organize a nation-wide crop strike, organizers settled on tractorcades as a less costly means of drumming up publicity and attention from state legislators. 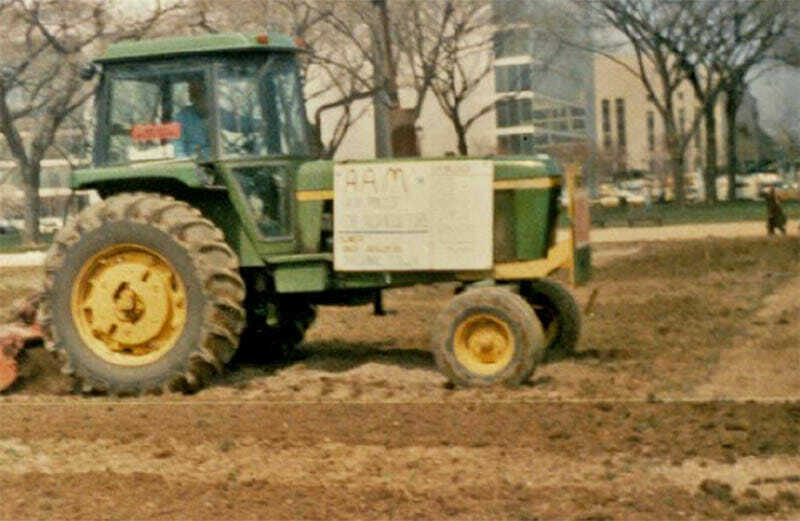 The AAM put together their first national tractorcade in 1978, which historians remember as an organizational success compared to the larger effort a year later. 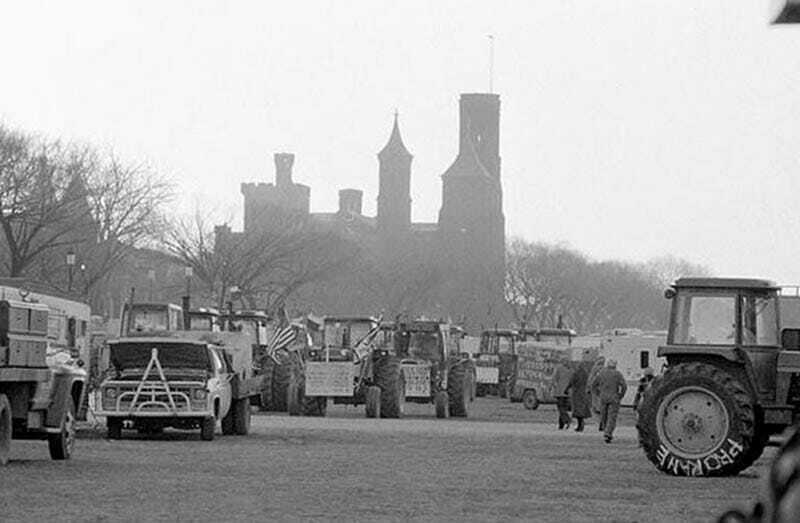 In their history of the organization, John Dinse and William P. Browne distinguished the second protest from the first by its general lack of civility and the damage to public facilities, much of which occurred as the heavy tractors rested on the National Mall. Washington billed the demonstration for $1 million dollars in damage, but a group of Maryland farmers volunteered to fix the national greens after the others had left. Protesters tipping a thresher onto the White House lawn. Photo courtesy of the Kinsley Library. Photo by Darrel Miller. Matlack regrets that the press — and now history — focuses on the “troublemakers” that broke through public barriers, threw a thresher over the White House fence and accidentally totaled some police motorcycles beneath their vehicles. 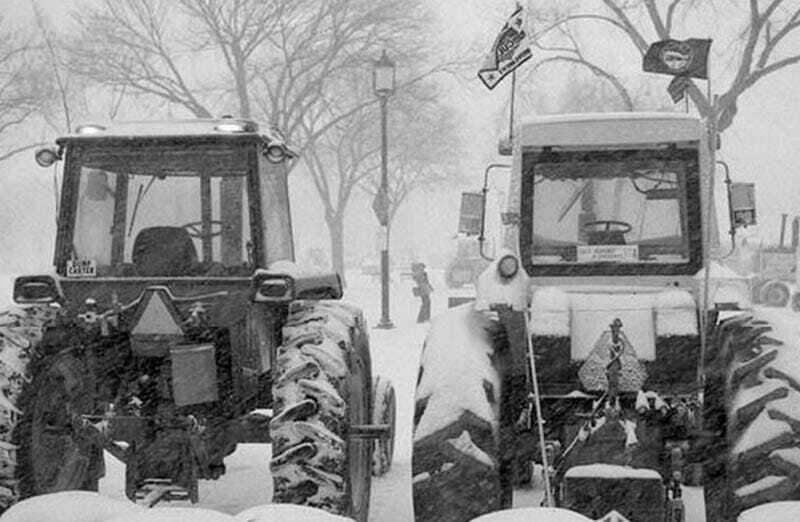 Tractors following President’s Day weekend blizzard. Photo courtesy of the Smithsonian Institute. Photo by Jeff Tinsley. 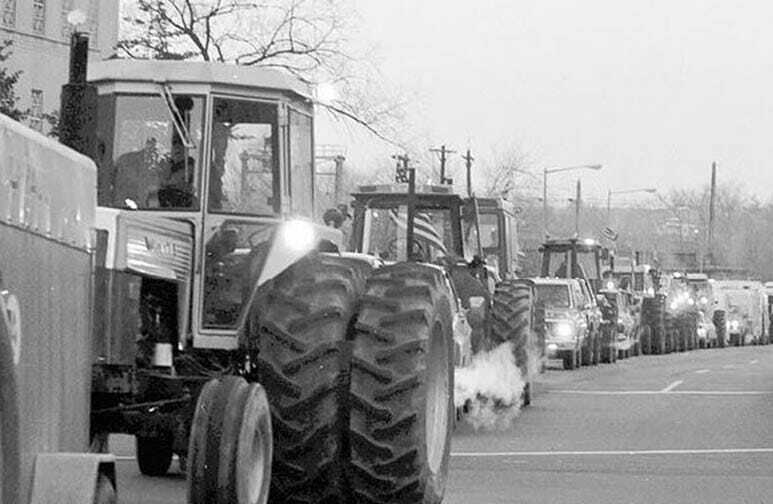 If there’s one lesson Matlack hopes to keep alive from the 1979 tractorade, its that changes to farm policy don’t happen overnight or even over a few weeks of intense protest. The legislative victories that the AAM has helped achieve since — such as a country-of-origin labeling rules and ethanol requirements — have taken years to enact and even longer to defend. The prolonged, frustrating nature of politics, in his view, doesn’t always jive with farm life. Still, tractorcades have stuck around as a way for farmers to gain attention. 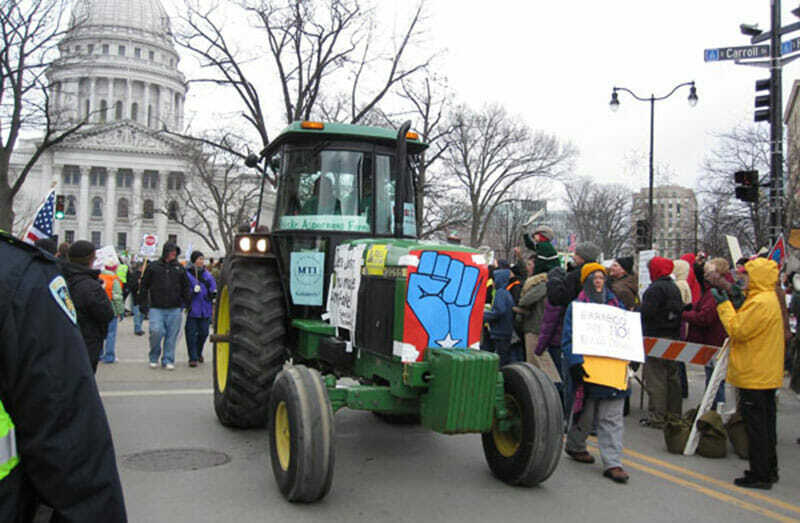 Most recently, a set of Wisconsin farmers took a convoy of tractors to Madison, Wisconsin to protest Gov. Scott Walker’s legislation restricting collective bargaining. Tractorcade in Madison, Wisc. Photo courtesy of SEIU International. Photo by Jeff Miller. I think they should have a major tractorcade to force Congress to fund the wall. Seems like all they understand is a very loud voice that doesn’t go away.